News comes weeks after another poll found the out candidate surging in Iowa. A new poll shows South Bend, Ind. Mayor Pete Buttigieg surging in a second early state. The out presidential candidate comes in at third place in a Saint Anselm College Survey Center poll of New Hampshire voters. “The emerging dark horse in this race may be Pete Buttigieg, who has gone from a virtual unknown to vault to 11 percent support, trailing only Biden and Sanders and ahead of Warren,” said New Hampshire Institute of Politics Executive Director Neil Levesque. The poll also tested name ID favorability ratings among candidates and found Buttigieg making massive gains there. Among those surveyed, 42.3 percent hold a favorable view of Buttigieg, and just 5.5 percent held an unfavorable view, the lowest unfavorable among any of the 14 candidates in the survey. About 69.9 percent of voters knew of Buttigieg. But its striking that the Midwesterner beats a New Englander like Warren. Sanders won New Hampshire in 2016 on the way to losing the Democratic nomination to Hillary Clinton. This isn’t the only early primary state where Buttigieg shows strength. 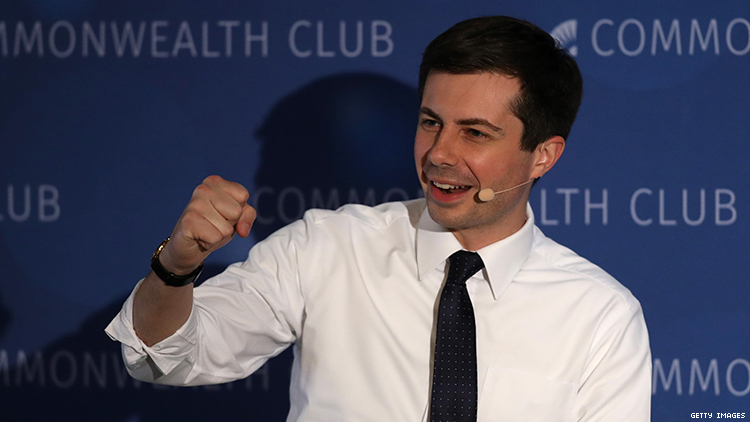 An Emerson Polling survey released in March showed Buttigieg in third place in Iowa. The Democratic race formally kicks off with Iowa caucuses on Feb. 3, 2020. New Hampshire holds the first primary of the 2020 cycle on Feb. 11.